The government-owned weather sentinel was deployed into orbit more than 500 miles (800 kilometers) above Earth by the Delta 2 rocket to begin a seven-year mission. The successful launch was the second-to-last flight of a Delta 2 rocket, but it also signaled a beginning for NOAA’s Joint Polar Satellite System, a multi-spacecraft program established in 2010 under civilian leadership after the cancellation of an over-budget joint weather satellite initiative with the U.S. Air Force. Atmospheric measurements from the new satellite will feed computations by numerical prediction models, which process data multiple times every day to forecast storm developments and movements days and weeks ahead of time. But the finely-tuned computer models are worthless without accurate data inputs, and NOAA’s polar-orbiting weather satellites gather much of information fed into models that predict hurricane tracks, flooding rains and winter storms before they arrive. 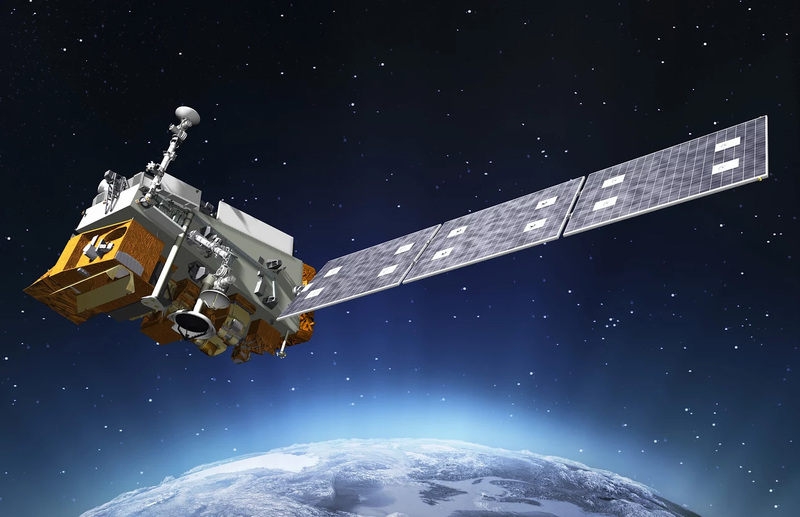 JPSS 1 will be renamed NOAA 20 once it reaches its final orbit and becomes operational in approximately 90 days. “Launching JPSS 1 underscores NOAA’s commitment to putting the best possible satellites into orbit, giving our forecasters — and the public — greater confidence in weather forecasts up to seven days in advance, including the potential for severe, or impactful weather,” said Stephen Volz, director of NOAA’s satellite and information service. The Delta 2 rocket fired its RS-27A main engine in the final few seconds of Saturday’s countdown, and six strap-on solid rocket boosters ignited at 1:47:36 a.m. PST (4:47:36 a.m. EST; 0947:36 GMT) to propel the launcher away from Space Launch Complex 2-West at Vandenberg Air Force Base northwest of Los Angeles. The main engine and six boosters combined to generate nearly 800,000 pounds of thrust at full power, sending the half-million-pound Delta 2 rocket faster than the speed of sound in 33 seconds as it quickly arced south from Vandenberg. The six ground-lit boosters, made by Orbital ATK, burned out after about one minute, and three air-lit motors ignited to continue the trip into space. The first six boosters jettisoned to fall into the Pacific once the Delta 2 was safely away from offshore oil rigs, and the other three followed less than a minute later. The Aerojet Rocketdyne RS-27A main engine, with design roots from the Saturn 1 and 1B rockets of the 1960s, continued firing with 200,000 pounds of thrust, consuming a mixture of rocket-grade RP-1 kerosene and liquid oxygen. The Delta 2’s first stage shut down and jettisoned around four-and-a-half minutes into the flight, leaving the second stage’s AJ10-118K engine to complete multiple firings to place the JPSS 1 weather satellite and five secondary CubeSat payloads in orbit. The second stage engine’s first burn ended nearly 11 minutes after liftoff, and the rocket passed over Antarctica before heading northbound over the Indian Ocean. Then its engine fired again for a 24-second engine restart. The second AJ10 engine firing placed the JPSS 1 spacecraft in its planned 500-mile-high nearly-circular orbit orbit, setting the stage for deployment of the satellite at T+plus 57 minutes, 30 seconds. Live video transmitted from the rocket showed the JPSS 1 satellite receding from the second stage after explosive bolts and springs engaged to push the craft away. Engineers with Ball Aerospace and Technologies Corp., JPSS 1’s manufacturer in Boulder, Colorado, confirmed the satellite unfurled its power-producing solar array wing as scheduled a few minutes later. The solar panel extension is one of the first major steps in the life of a satellite. Meanwhile, the Delta 2’s second stage maneuvered away from JPSS 1 and ignited its engine a third time to slightly shift its orbit for release of five CubeSats developed for educational and research missions and sponsored by NASA. The CubeSats range in scale from the size of a Rubik’s Cube to a toaster oven, and NASA paid for their launch on the Delta 2 rocket. MiRaTA, a compact atmospheric sensing nanosatellite from Massachusetts Institute of Technology that will measure temperature, water vapor, and cloud ice in the atmosphere for severe weather monitoring and the study of cyclone structure. MakerSat-0, a CubeSat from Northwest Nazarene University in Nampa, Idaho, carrying several student-build experimental payloads. 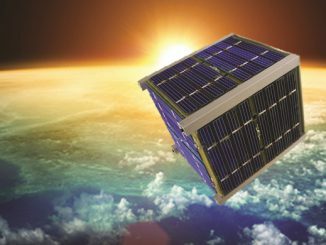 RadFxSat, a technology demonstration mission to monitor ionizing radiation effects in a memory integrated circuit from Vanderbilt University and AMSAT. EagleSat-1, a scientific investigation developed by Embry-Riddle Aeronautical University in Prescott, Arizona, that will attempt to measure the decay of the satellite’s orbit over time by the means of an unlocked Global Positioning System receiver in the space environment. Buccaneer, a CubeSat developed by the Australian Department of Defence and the University of New South Wales that carries a 10.5-foot (3.2-meter) deployable antenna to calibrate over-the-horizon radars used by the Australian military. The CubeSats were ejected from three PPOD carriers affixed to the Delta 2’s second stage, and telemetry radioed from the rocket indicated all three deployers opened their doors as expected. A final burn of the second stage engine steered the rocket on a trajectory toward a destructive re-entry to keep it from becoming another piece of space junk. 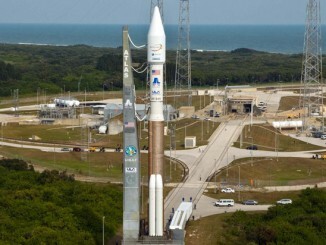 “Things went absolutely perfect today,” said Omar Baez, the NASA launch manager for Saturday’s flight. “The weather cooperated with us, and the upper level winds cooperated with us. The vehicle was perfect, the spacecraft was perfect. The range instrumentation worked great. Couldn’t ask for better. “The nation’s got another wonderful weather asset up in space, and we can’t wait to have the products coming back from it,” Baez said. Two launch attempts earlier in the week were scrubbed by boats that ventured into an offshore exclusion zone, a technical alarm on the rocket, and brisk westerly winds aloft that threatened to blow debris from the Delta 2 back over land. “It took a little bit longer than we thought, but we got it done,” Baez said. JPSS 1 is the first of four new polar-orbiting satellites under development by NOAA in partnership with NASA. The quartet will ensure the U.S. weather agency continues receiving measurements from polar orbit through 2038, officials said. The $1.6 billion satellite mission features five instruments to monitor Earth’s atmosphere, ozone layer and radiation reflectance, providing data for numerical forecast models designed to produce three-to-seven day weather outlooks. The JPSS program overall is budgeted at $11.3 billion, including the satellites, instruments, launch services and ground network. “These are exciting times for NOAA,” said Ajay Mehta, acting director for systems in NOAA’s satellite and information service. The first in a new generation of geostationary satellites, named GOES-R before launch and since renamed GOES-16, lifted off from Cape Canaveral last November. The geostationary satellites provide near real-time imagery of cyclones, storms, lightning and other phenomena, while polar-orbiting weather satellites gather background data on the forces that drive changing weather patterns. “The satellite systems are complementary, and both are critical for NOAA to provide a complete picture of what’s happening with the weather today, tomorrow, next week, or next month,” Mehta said before JPSS 1’s launch. 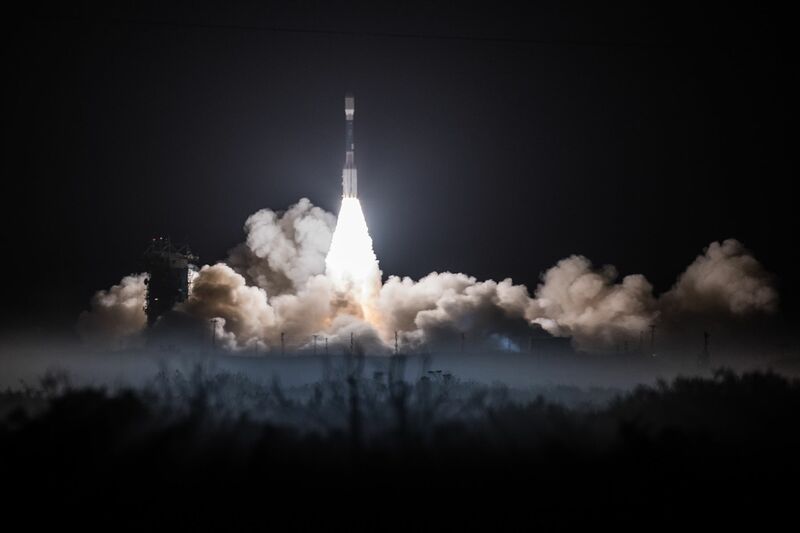 JPSS 1 follows the launch of a pathfinder satellite named Suomi NPP in October 2011. 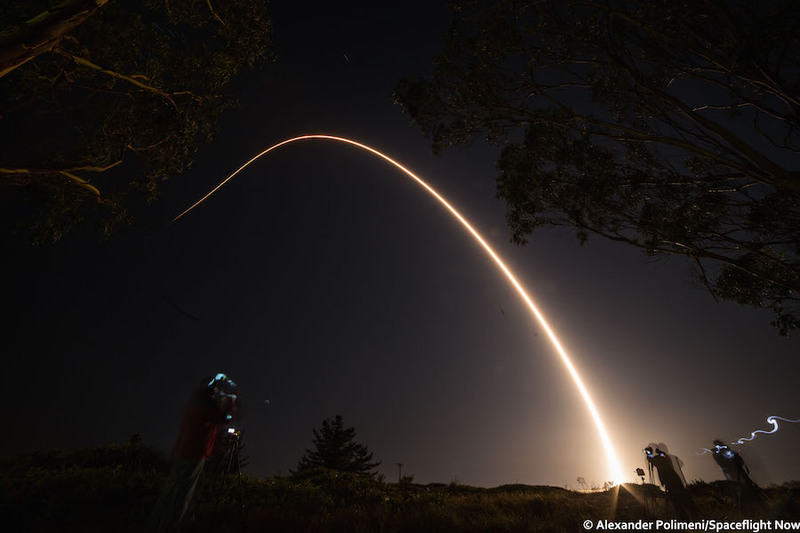 That spacecraft is now operating beyond its design life, and JPSS 1’s launch was timed — to the second — to allow it to enter an orbit around 50 minutes behind Suomi-NPP for tandem observations. While JPSS 1 is the first in a new generation of weather satellites, its launch extends a line of meteorological spacecraft dating back to 1960. “To provide the observations, JPSS carries five highly sophisticated instruments, instruments so precise that they can measure temperatures to better than one-tenth of a degree in the entire atmosphere from the Earth’s surface up to the edge of space,” said Greg Mandt, director of the JPSS program at NOAA. 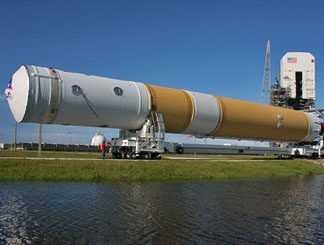 The second JPSS mission is scheduled to launch in 2021 on a ULA Atlas 5 rocket from Vandenberg. NOAA, the U.S. Air Force and Eumetsat, the European weather satellite agency, have a partnership to share data collected by each organization’s polar-orbiting meteorological observatories. NOAA’s satellites have afternoon coverage, and the U.S. military’s DMSP satellites fly in a similar polar orbit with early morning passes. Europe’s Metop spacecraft are in orbits timed to make observations in mid-morning. Saturday’s launch marked second-to-last flight of the venerable Delta 2 rocket, which has conducted 154 missions since its introduction in 1989, launching interplanetary missions to the moon, Mercury, Mars, comets and asteroids, NASA’s planet-hunting Kepler observatory, and numerous commercial and military satellites, including the bulk of the GPS navigation network in the 1990s and 2000s. The Delta 2 traces its heritage back to the Thor missile from the Cold War era. One more Delta 2 is set to launch from Vandenberg in September 2018 with NASA’s ICESat 2 mission.